Hair loss can occur for a variety of reasons, ranging from imbalanced hormones and stress to chemical damage to seemingly genetic factors. Fortunately, there is a chance you can stop hair loss and potentially regenerate new hair with essential oils and scalp massage. Aberdeen Royal Infirmary Hair Loss Study In 1998, Scottish dermatologist Dr. Isabelle C. Hay and a team of researchers from the Department of Dermatology at the Aberdeen Royal Infirmary studied the effect of essential oils on 86 patients who suffered from hair loss. The double-blind, controlled study took place over a seven month active period with follow-ups at three and seven months after the treatment. Researchers divided the 86 patients into two groups – active and control. Over a seven-month period, the active group massaged an essential oil recipe onto their scalps daily for two minutes. The control group used the carrier oils jojoba and grapeseed only. Dr. Hay and the research team found that essential oils safely stop hair loss as well as stimulate hair growth. 19 of the 43 patients in the active group demonstrated significant improved hair growth. Only 6 of the 41 patients in the control group showed some slight improvement. One man in the active group grew a full head of hair after being completely bald. Many of our Optimal Health Network clients struggle with hair loss, so we decided to see if we could stop hair loss and regenerate new hair. 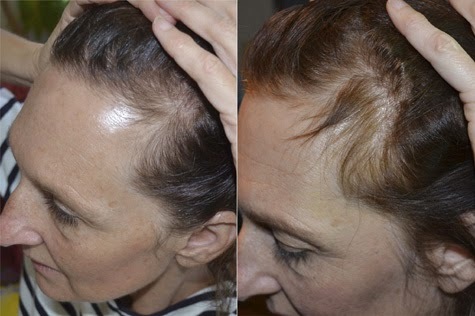 CLIENT TESTIMONIAL FROM GRETA: "My hair loss has just really, really slowed! I went from losing about 100 hairs a day to 15 or 20… I am amazed because I am rubbing over a white comforter cover, and I have maybe six hairs fall out. If I did that [3 months ago] I would probably have 20 hairs fall out, so it's really slowed down!... My hair's growing a lot faster than it used to and I am slowly starting to get more hair, especially around my hairline. It's really exciting!" Either use a small glass oil dispenser jar and mix a large batch for future use or mix enough for a single use in a small bowl (use a total of 8-10 drops of essential oil blend per scalp massage). Combine the desired amount of essential oil blend with ¼ that amount of the carrier oil (for a 4:1 ratio). For example, if you mix a single use with 8-10 drops, you should add 2-3 drops of base oil. If you mix a larger quantity of 100 drops, add roughly 25 drops of the base oil. NOTE: Most base oils are difficult to measure in drop quantity, so an estimate is fine. Also, coconut oil may need to be heated and melted before mixing and before each use if it is kept at a low enough temperature. Shake or the oils together to mix the recipe. If mixing single use in a bowl, use fingers to mix and apply directly to scalp. Always mix essential oils with a carrier oil. Undiluted essential oils are too harsh on the scalp. Apply the essential oil recipe to the scalp when the hair is dry for the best distribution. As shown in the scientific study, this process is not guaranteed to work for everyone or for all types of hair loss. If you do not notice slowed hair loss and/or increased new hair growth within 3 months, consider a consultation with Kristina Amelong. Hair grows in three different cycles: anagen, catagen, and telogen. These hair growth cycles don't work well with hormone imbalance. Standard Process's Symplex F and protomorphogens and MediHerb's liquid herbs like Ashwaganda and Rehmannia, along with a therapeutic colon cleanse program, will help to balance your overall hormonal levels - pituitary, hypothalamus, progesterone, estrogen, etc - which all play a role in the hair cycle. This is definitely worth a try! I love essential oils but I never thought to use them for hair loss. Hi, I'd like to know whether we should apply the essential oil blend before or after we wash our hair. Thank you. Use the oil either before or after washing your hair. Your personal preference is the most important factor. If I apply the essential oil everyday, do I need to wash my hair every day or can I leave it for 1 or 2 days? After reading this blog, I was able to find the study and there is no information on what they did in terms of hair washing. No, you do not need to wash your hair every day. You can absolutely leave the oils on for a few days. Do let me know if you need further help and how using the oils for hair regeneration works for you. In the study, they used a much lover concentration of essential oils. Isn't 1:4 ratio too strong? In the article we recommend a 4:1 ratio as one example of how to mix the oils with a carrier oil. If this ratio seems to concentrated for you, you can add more carrier oil and create a ratio that works best for you.